For many swimmers, the word shark is synonymous with fear. So it's no wonder the National Aquarium in Baltimore has opened an exhibit to counteract some of the misconceptions about sharks. Andy DeHart, a shark biologist from the National Aquarium, visited The Early Show to provide some facts about sharks. He also brought an almost three-foot-long female spotted bamboo shark with him to the studio. There actually is no typical shark. The nearly 400 species of sharks vary widely in habitat, size, features, diet and lifestyle. Sharks range from about six inches long, such as the cigar shark species, up to about 45-feet long like the whale shark. More than 50 percent of sharks are three-feet long or less; more than 80 percent are under five feet. And they range from shallow to deep water and from the Arctic to the Tropics. The truth is that many shark populations are decreasing, says DeHart. The chief reasons for this are bycatch (when fishermen toss away unwanted fish in their nets as garbage), overfishing and "finning," where sharks are killed for shark fin soup. Also, sharks mature late in life and produce very few young, in contrast with bony fish that generally lay large numbers of eggs. If people don't protect sharks, the ecological balance of the oceans will be severely threatened, explains DeHart. While sharks are primarily meat eaters, different species consume different kinds of food. 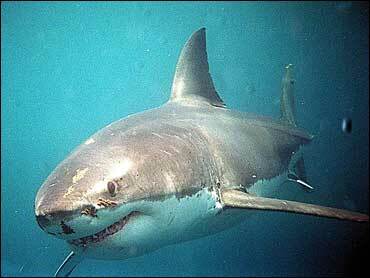 Teeth often give clues to what sharks eat. Sharks with serrated edges on their teeth rip their prey, while sharks with pavement-like teeth eat mollusks and crustaceans. Some sharks are "generalists" and eat whatever is at hand, but many species are rather selective. The basking shark and the whale shark, for instance, feed on plankton. Sharks eat much less than many people believe; many may go for days or even weeks between feedings. The chances of being attacked by a shark are unlikely. For perspective, people are 250 times more likely to be killed by lightning than by a shark. As people increasingly invade sharks' habitats, shark incidents also will increase. DeHart suggests the following to avoid a shark attacks: Avoid swimming at dawn or dusk when visibility is decreased. Avoid areas where waves are breaking, as turbulent water makes it difficult for sharks to see and determine whether you are prey. Do not wear jewelry in the water. Sharks are attracted to shiny fishes, and jewelry may resemble their scales. Do not swim near schools of small fish, which are favorite foods of some sharks. Sharks and their relatives, skates and rays, are extremely vulnerable to overexploitation by man, habitat destruction and pollution. DeHart says the animals deserve respect and need protection. He explains people can help by avoiding polluting ocean waters; refusing to buy shark fin soup and shark cartilage supplements; making wise seafood choices; writing to their legislators for more shark protection laws; and learning the facts about sharks instead of perpetuating the myths. Know Your Seafood Dining: When dining on seafood, make the best choices possible to avoid eating fish that are on threatened or endangered species lists. If you can discern where and how the fish were caught, that will aid your choice. Fish caught by longlines or trawls have bycatch, which consists of fish that are tossed out as garbage. As an example, for every 10 pounds of shrimp caught, about four pounds of bycatch are wasted. Some choices, says DeHart, are farm-raised catfish and many Pacific species such as sole, flounder, and halibut. Locally, Maryland rockfish (properly called striped bass) are a good option because of Maryland's management program for these fish. You have the right to ask restaurant staff and fish wholesalers where and how fish were caught. Avoid Shark Medicine: Don't purchase products that use shark cartilage. Some medical and diet products contain shark cartilage. DeHart says there is no proof that shark cartilage has any effect on cancer. Don't Buy Shark Souvenirs: Avoid buying shark products for use as souvenirs. Avoid Shark Food: Avoid buying or eating shark fin soup at home or abroad. Sharks are killed in a cruel manner solely for a select part of their fins from which the soup is made. Be Aware of Shark Laws: DeHart says to let government officials know about your interest in legislation that protects sharks and their relatives. Letters, email and phone calls are all easy methods to make your preferences known to those who enact laws. Choose An Elected Officials That's Right For You: If you are concerned about the welfare of sharks, DeHart suggests voting for people with a demonstrated interest in the environment. Educate Yourself: DeHart also says to continue learning about aquatic life and ocean health. Web sites, such as the National Aquarium in Baltimore and Ichthyology at the Florida Museum of Natural History, are good resources for more information about sharks. Support Aquariums: Some aquarium provides research to learn the behavior of sharks and and help them survive. Some also participates in shark tagging programs. DeHart says the more knowledge about sharks collected, the better.